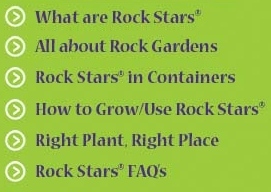 Here you'll find information to help with selecting Rock Stars® for different purposes. Our longer, printable PDF version of this page is more detailed. Carpet - plants that grow flat to the ground, or almost flat. Also known as a mat. Aim to build a collection of Rock Stars® with different shapes, in order to provide a variety of textures. For example, a rosette or cushion-shaped plant can look lovely surrounded by a flat-growing carpet to accentuate that cute bun-shaped or mounding habit. 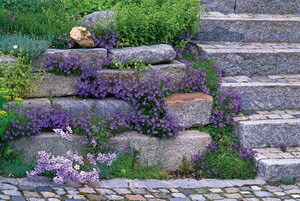 In containers, troughs and walls, a spreading or carpeting plant will cascade over the sides in a charming way. Tufts and subshrubs are more substantial in size and provide some good structure in a miniature planting. As well as considering plant shapes and sizes, matching together Rock Stars® with similar growth rates is a wise idea, so that they all get along. Our Advanced Search allows you to search by this attribute. You don't want your plants to live in a battlefield, so be careful when placing Rock Stars® with a slow or a fast rate of growth. We have indicated a slow, medium or fast rate of growth for all of our plants. Variety, texture, size and colour. Blooming season, foliage colour and texture, and specific site conditions (i.e. sun exposure, soil type and soil moisture) are other criteria you can specify using our Advanced Search feature. Aim to have a mix of plants in different shapes, sizes, colours and seasons of bloom, but choose ones with similar requirements to match the site you have in mind. They will be happier plants and you will be a more successful gardener. 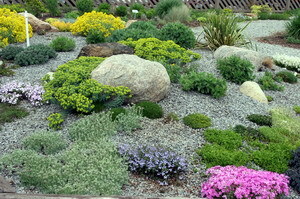 The easiest way to kill your Rock Stars® is by planting them in average perennial border conditions. Soil drainage may not be to their liking, and many will succumb to rotting as a result. Vigorous-growing neighbours such as Daylilies and Summer Phlox might grow over them or cast too much shade. Even if they thrive, your Rock Stars® will be too small and look out-of-place with the usual range of perennial border plants, though there are exceptions to this theory. Some Rock Stars® make fine border-edging plants, and we have included this attribute in our Advanced Search.